Former Chief Justice of Pakistan Iftikhar Muhammad Chaudhry’s tenure, from 2005 to 2013, has been characterized by remarkable developments in constitutional politics and the jurisprudence of the apex court. This was also a period of great controversy and the actions of the Chaudhry Court polarized the debate on the role of the Supreme Court. Despite the emergence of such vociferous debate, a detailed scrutiny of the Chaudhry Court’s actions has thus far been lacking. 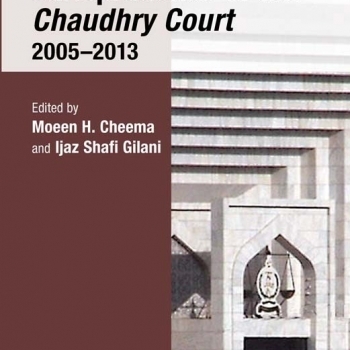 This volume represents an attempt to fill this gap by closely analysing the jurisprudence of the Supreme Court and reflects on the likely legacy of Chief Justice Iftikhar Muhammad Chaudhry’s tenure. This volume also denotes a deliberate effort at deepening the debate that has surrounded the court’s actions during the last few years, going beyond the critique of the court on the grounds that it has acted politically and violated the constitutionally-mandated separation of powers between the judiciary, the legislature and the elected executive. The contributions to this volume provide an in depth analysis of the jurisprudence and judicial politics of the court, adding layers of nuance and complexity to the debate on the role of the Supreme Court in Pakistan’s constitutional politics.